Twitter has been a nonstop news machine during this year's contentious presidential election, but will the popular social network even exist the next time Americans hit the polls? Twitter has played an outsized role in a 2016 presidential election that continues to test the electorate. Despite Twitter's ongoing business problems, the ability of a single tweet to shape political conversation and drive media coverage has never been greater. A marked contrast exists between Twitter's business acumen (or lack thereof) and the sometimes seemingly unintentional influence it wields on the current election. The leading candidates for America's next presidency use Twitter to energize their supporters and draw citizens who wouldn't otherwise follow political discourse. Twitter's simple and personal messages resonate in a way that more traditional means of communication — mail robocalls and yard signs — no longer can. Much of Twitter's staying power in contemporary politics is directly related to Donald Trump's clever, and at times haphazard, penchant for speaking his mind using tweets. Twitter is Trump's medium of choice, and for the most part he has been rewarded for showcasing his freewheeling spirit. The presidential candidate's ascent and Twitter's significance on the political stage are inextricably linked. "Twitter was taken to a new level this year because of Donald Trump," says Barry Burden, political science professor at the University of Wisconsin in Madison. "His aggressive and unconventional use of the platform generated news" for many days throughout the campaign, even when Trump's tweets "violated standard norms of campaigns by being uncivil, conspiratorial or offensive." Twitter's real-time nature and emphasis on brevity make it especially well-suited for politicians and advisors who are skilled at crafting soundbites, according to Laurie Rice, associate professor of political science at Southern Illinois University Edwardsville. "Twitter is also a useful form of two-way communication between candidates and campaigns and voters," she says. "Candidates and campaigns can gauge reactions to their messages in real time, voters can easily share their views, and campaigns can track and respond to voters' evolving views over the course of the campaign." Political messaging now caters to social media to some degree, and consultants have turned heavily to Twitter to push their candidates' agendas, according to Vincent Raynauld, assistant professor in communication studies at Emerson College in Boston. Trump is also particularly adept at using simple language to share his unfiltered views on Twitter in a way that matches his campaign branding, according to Raynauld. "When you read a tweet by Donald Trump you can almost hear Donald Trump's voice, whereas if you're reading tweets by Hillary Clinton from her Twitter account you can obviously see that it's coming from campaign staffers," he says. "You have a sense that every single tweet comes out of Donald Trump's mouth to some extent and this has a very persuasive value to the public." A recent survey by the Pew Research Center found that social media fuels widespread polarization and partisan animosity, and the associated debates turn off more people than they attract. 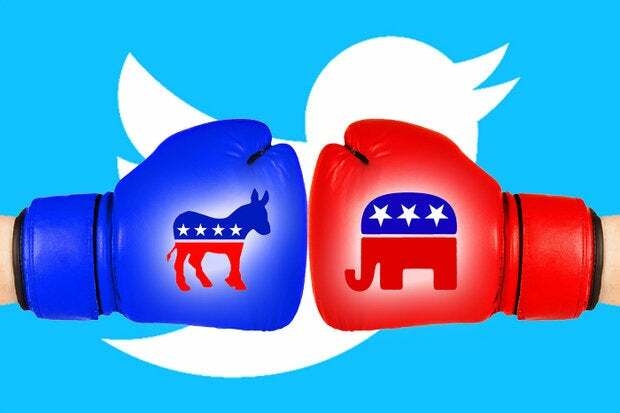 Twitter is a popular outlet for contentious political conversation, but it isn't alone. "Political content is as prevalent on Facebook (where users mostly follow people they know personally) as it is on Twitter (where users tend to follow a wider mix of connections)," the report reads. Social media enables conversations that never would have happened without it, according to Irina Raicu, internet ethics program director at Santa Clara University's Markkula Center for Applied Ethics. "But the unfiltered aspect of social media has also led, on some platforms, to some very toxic exchanges — toxic enough to drive people completely out of the conversation," she says. "We have also seen that social media can enable the easy, fast and widespread dissemination of misinformation." Twitter makes political discourse more accessible, but the 140-character limit also means it's virtually impossible to share in-depth policy proposals on the service, Raynauld says. "This is oversimplifying the context of campaign discourse" and makes it difficult for people to get a greater understanding of the candidates' cornerstone ideas, he says. Twitter has been particularly important to young adults, a group that now represents an equal share of the electorate as the baby boomer generation, according to the Pew Research Center. "Certainly they're on Facebook, and people are talking about the election on Facebook, but Twitter has really taken center stage and kind of pushed Facebook off to the side, especially with younger voters," says Laura Weir, executive director of international education at Florida SouthWestern State College. Future politicians will likely take cues from both Trump and Clinton on Twitter and apply lessons learned to future campaigns, according to Raynauld. "I suspect that politicians will go even more personal when it comes to politics in upcoming election cycles, where they will really let their personality shine through to show they're not part of a machine, and that it's really them talking." The outcome of the 2016 presidential election should influence future politicians and their social media strategies, as well. Trump has consistently generated media coverage from traditional outlets thanks to his tweets. However, much of the associated reporting was "negative and came as a result of issuing inflammatory tweets," Rice says. Clinton may have been more active on Twitter, but her account was also "more heavily managed by the campaign and did not seem to be as successful at generating news media coverage." Will another election play out on Twitter? Twitter's effect on the 2016 presidential election cycle will have lasting reverberations. Yet the company could potential be out of business by the time Americans head to the polls in 2020. The current election also reinforces the idea that Twitter is becoming less of a social network and more of a news-making medium with a social bent, according to Raynauld. Twitter's future is uncertain, but the format it introduced will have a lasting impact on politics, he says. When Twitter's cofounders formed the company a decade ago it's unlikely that they "envisioned helping to transform the political landscape, but that's what they have done," Rice says. "Although they have struggled to find a profitable business model to support it, they ended up creating an important platform for political expression that has helped people find their voices."